Buenos Aires (AFP) – A Buenos Aires court ordered Uber to suspend service Wednesday and launched an inquiry into whether the app is unfair competition, a day after it began operating in the Argentine capital. The suspension of Uber, a smartphone app that connects riders and drivers but which has faced legal complaints in several countries, will remain in effect until a court has made a final ruling, the 15th Circuit Court said. 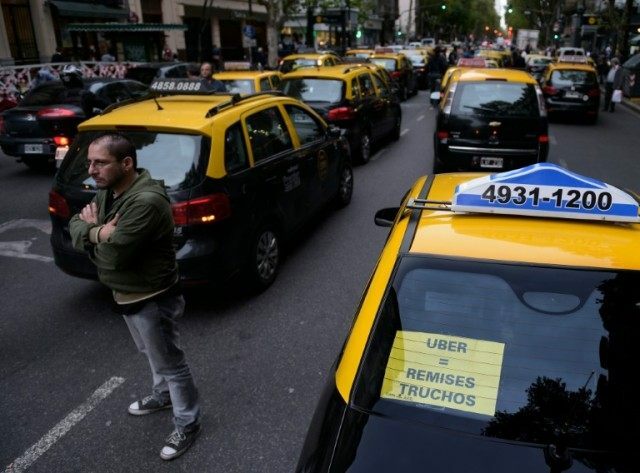 Uber launched Tuesday in Buenos Aires without authorization, triggering protests by taxi drivers who blocked major avenues and snarled traffic. Although ride-hailing apps have risen rapidly globally to become a booming industry, they face stiff resistance from traditional taxis and bans over safety concerns and questions about legal issues, including taxes. Taxi drivers often complain that Uber drivers do not pay for permits or taxes. Uber argues it is not a transport company like taxi firms. “What they are doing is illegal. They are not delivering transport under existing laws,” Buenos Aires transport chief Juan Jose Mendez said this week. Licensed taxi drivers, who must undergo hundreds of hours of training in some countries, accuse Uber of endangering their jobs by flooding the market with cheaper drivers who need only a GPS to get around.